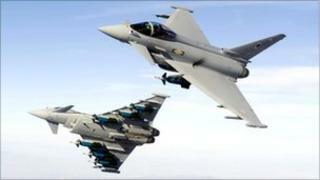 RAF jets were scrambled to intercept a passenger flight into Manchester, the Ministry of Defence (MoD) has said. The BMI Baby flight from Prague sparked a security alert when it lost contact with air traffic control on Sunday. BMI Baby said the pilot had restored radio contact before the Typhoon fighters from RAF Coningsby arrived. It said passengers and crew were not at risk. The RAF said its response was part of its role to protect the UK's airspace. The MoD said Typhoon aircraft from RAF Coningsby were launched to investigate a flight which had lost radio contact with air traffic control before it landed safely at Manchester airport. "This is a routine part of the RAF's air defence role to protect UK airspace," a spokesman said.